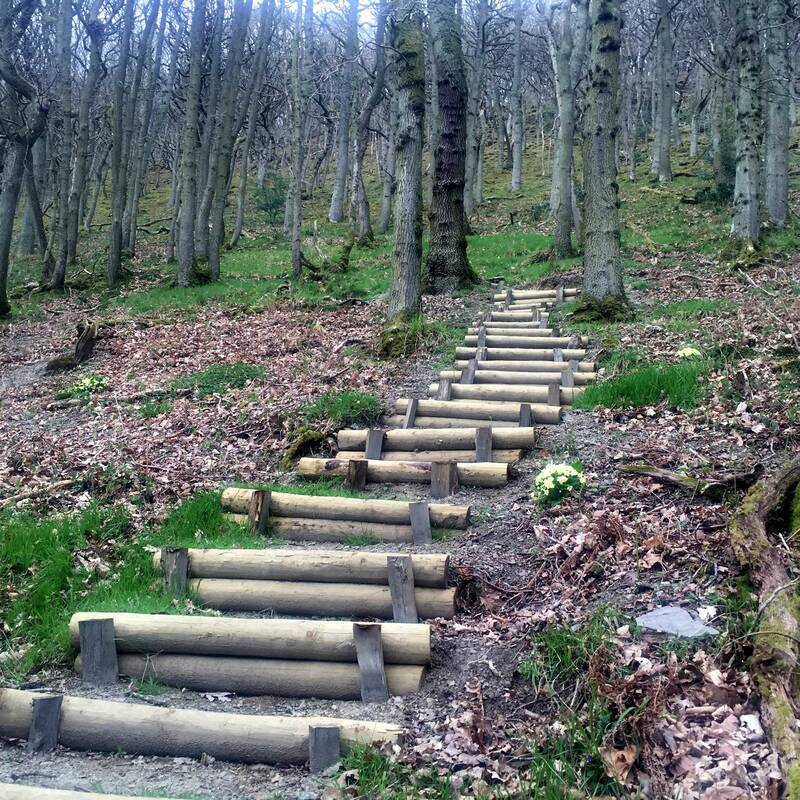 One of our first projects was the construction of a flight of rustic steps up the slope and deep into the wood. The incline of Brineddin Wood is extremely steep, and a deterrent to all but the fittest to venture further in. Yet it’s only deep inside the wood that the majesty of the trees and the tranquillity can truly be appreciated. What better way to enable more people to fully enjoy the wood than to construct a stairway winding up the slope between the trees away from the public footpath? It’s taken half a dozen work parties during 2014 and 2015 to build 98 steps. It sounds a lot, and is a lot, but even at step 98 you’re probably only a quarter of the way to the upper limit of the quillet. To begin with we used odds and ends of wood to practice our step building techniques – bits of wood we’d found in the backs of garages; pieces of garden furniture that had seen better days; a couple of fifty year old oak posts that Bob James remembered hammering in as fence posts with his Dad in the 1950s! They all worked well. Later on when we’d run out of scrap timber we bought the proper materials – half-round poles which we sawed into thirds for the horizontals, and chestnut stakes for the verticals. It was slightly competitive to begin with. Was Ollie’s and Martin’s careful “Craftsman’s” technique, more effective than Anthony’s and Patrick’s “speed-building”? Who knows? who cares? The point is that we’ve got as far as we’re going for the time being and we’re all very proud of it. There are four rustic benches – one at the bottom made for us at the 2013 Woodland Fayre, two to break the climb, and one at the very top. Bob James brought his chain saw to make the last two from a fallen oak. It really is the nicest possible way to spend a spare hour, walking round to the quillet and sitting quietly with a thermos of coffee and a chocolate bar while the birds gradually emerge. On a windy day, it’s positively exhilarating to stretch out on the top bench and watch, listen and wonder as the treetops sway noisily in the breeze. At the foot of this page there’s a small gallery to click on to see our intrepid step builders at work (afterwards press Esc to return to main site). Anthony and Patrick, the speed builders. The end is in sight (note – three clumps of primroses). Ollie and Martin, the craftsmen. Simon brings a new load of stakes.